Nwâ is a fusion of Soul and African folklore (Afro-Soul) originally adapted from an Igbo folk tune serves as a "Lullaby". The artiste dedicates it to the African child tragically under the pressure of a changing world and to the victims of child abuse. Ifé is a Nigerian Afro-soul Artiste and song writer who basically centers her music on African culture and heritage. She recycles and fuses (Igbo) folk tunes with soul music, thereby enriching the Afro-soul genre. Her musical journey remains rivetingly adventurous as she also explores with different sounds. Iféchukwu Mercy Chínyere Michael is from Umuawulu in Awka South Local Government Area, Anambra State, Nigeria. She is a graduate of Music and Performing Arts from the University of Nnamdi Azikiwe, Awka, Nigeria. She plays the guitar, thumb piano (Uboaka) and Keyboard. 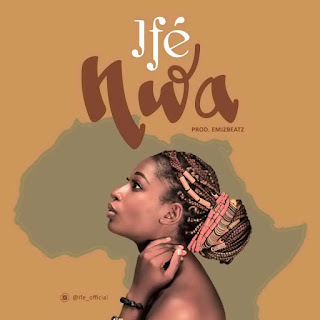 Nwâ, her first official single, is a fusion of Soul and African folklore (Afro-Soul) originally adapted from an Igbo folk tune that serves as a "Lullaby". She dedicates it to the African child tragically under the pressure of a changing world and to the victims of child abuse.